Who’s The Fairest Running Back Of All? Yeah, I know, that’s a headline for a post anticipating the upcoming draft and that’s exactly what this is, albeit a tad early. 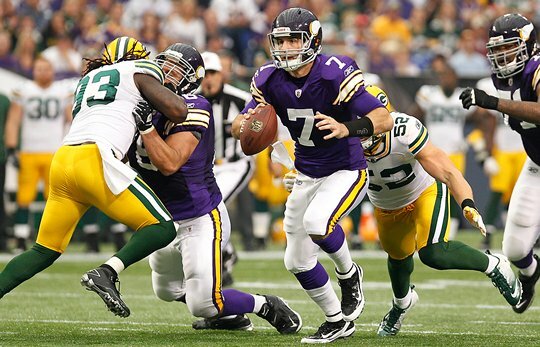 OFFENSE: I think we’ve found ourselves a quarterback in Christian Ponder and I’m very high on Joe Webb as well, but the question with him is whether or not the Vikings are comfortable wasting his talents sitting behind Ponder or if they’ll find a more productive role for Webb next season. If the Vikings do switch him to receiver, say (or maybe safety?? ), then we’ll need more quarterback depth that should probably be filled with a journeyman veteran and a prospect. If Webb remains where he is–and I’d hope Bill Musgrave would create a much bigger role for him–then we’re simply looking at quarterback fro development, which probably means a sixth or seventh rounder. We’re set at running back, of course, with quality depth behind Adrian Peterson. Ryan D’Imperio does not get a ton of snaps, so maybe there are things we’re not seeing but the converted linebacker looks far more capable of playing fullback than the abject failure that was Naufahu Tahi. I would not be surprised if Visanthe Shiancoe is not on the Vikings roster next year. He’s an unrestricted free agent and though he’s still productive and is one of the best personalities on the team, Kyle Rudolph may be a better player, rookie practice squad tight end Allen Reisner has shown he’s got some game, and I do believe it’s been scientifically proven that Jimmy Kleinsasser does not, in fact, age. As far as receivers are concerned, however, the Vikings do need to acquire an elite deep threat. That simple addition might’ve make the Vikings offense explosive enough to turn a 2-6 season into a 7-1 or 6-2 season, despite the obvious problems with the offensive line. And that is where I’d be perfectly fine if the Vikings spent half their draft picks. I’m still not sold on John Sullivan because I think we got better when Joe Berger was inserted into the lineup. Steve Hutchinson does not have many years left, Anthony Herrera can’t be depended upon to stay health, Charlie Johnson is not a cornerstone left tackle and Phil Loadholt still needs to prove he can anchor the right side consistently. With Jared Allen and Brian Robison as our bookends on the line, our pass rush is fantastic and we’ve got an embarrassing amount of depth there with Everson Griffen and Christian Ballard but Remi Ayodele is not the run stopper we’d hoped for and Kevin Williams has not been the dominant player we’ve come to expect him to be. It doesn’t get much better behind those two with Fred Evans and Letroy Guion. One would hope that Kevin Williams would bounce back next year but after nine years in the league, maybe he won’t? At linebacker, Erin Henderson has been outplaying his brother E.J. Henderson in pass coverage and with Jasper Brinkley waiting in the wings on injured reserve, you wonder if E.J. will be with us next year as well. Chad Greenway made a point of wanting to improve his pass coverage game this year; that hasn’t happened and he’s yet to make the standout plays that justifies his huge contract. The glaring hole on defense, and on the whole team for that matter, is the Vikings secondary. While Antoine Winfield promises he’ll be back for the Green Bay Packers game on Monday night, the guy has put in 13 years of stellar play so asking for more is asking for plenty. Chris Cook will remain on the 53 man roster but inactive until, presumably, his guilt or innocence is determined but that likely will not include playing this year. Cedric Griffin retains his starting role but no one is all that confident we won’t see much of the same we’ve seen from a guy who’s lost a step due to two blown ACLs. Asher Allen has performed better than expected this season but still, he’s had plenty of opportunities to seize a starting position but has failed to do so after three years. As dynamic a returner he is, it remains to be seen what we have in Marcus Sherels as a corner and we haven’t seen enough of rookie Brandon Burton to make a determination either. Likewise for rookie safety Mistral Raymond and the trio of Husain Abdullah, Jamarca Sanford and Tyrell Johnson do not inspire confidence. Think back to 2006 when the Vikings lost to the New England Patriots 31-7. The Vikings defense was considered among the NFL’s best yet Tom Brady threw for 372 yards and four touchdowns to ten different receivers. Bill Belichick exposed the Vikings secondary by simply putting more receivers on the field than the Vikings defensive backs could handle. That’s what the Green Bay Packers are like now: They have too many receivers who are too talented for the Vikings current defensive backfield to reasonably handle twice a year. Remember back in 1999 when the Packers started stocking up on big defensive backs as result of Randy Moss burning the crap out of them? That’s what the Vikings need to do now: Stock up on defensive backs. We can’t have too many. And while we’re stocking up on corners, maybe we want to consider shifting Griffin and Winfield (eventually) to safety. So far this year, Adrian Peterson has 798 yards and nine touchdowns on 167 carries. He’s also gained 125 additional yards on 16 receptions and another touchdown. Tennessee’s Chris Johnson? The self-proclaimed Best Back In The League has 366 yards on 121 carries but an additional 206 yards on 31 receptions. How many touchdowns has Johnson scored this year? One. Just one. If I could afford celebrity endorsements, I’d definitely get Bert Blyleven to shoot a video encouraging everyone to circle Minnesota Vikings Chat at Google+. Unfortunately (because that’d be awesome), we don’t have the budget. So instead, I’ll have to rely on just asking you directly to go to Minnesota Vikings Chat’s brand-spanking-new Google+ page and add us to you circles. Happy Belated Birthday to defensive tackle Fred Evans (28) on Sunday!